I don’t know about you but after the over indulgence of Christmas and New Year I seem to have begun the new year with an aversion to heavy stodgy food and find myself craving lighter, fresher, less carby and healthier meals. Being a lover of all things pasta and potatoes I do find it quite difficult to think of meal ideas that either don’t involve or completely cutout these usual carby elements. 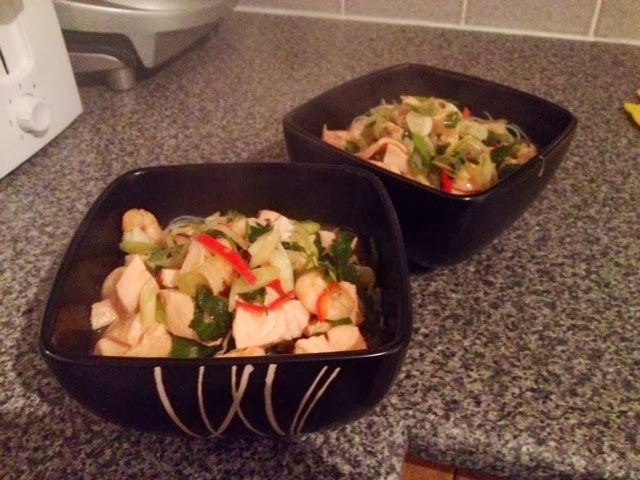 I’ve been doing a bit of research and find myself leaning towards Asian flavours and fish based dishes. I’ve adapted this broth from one of my many Good Food books. It makes a great Saturday night dinner and it’s really warming. It was pretty quick to do so I don’t see why you couldn’t do this as a weeknight dinner also. 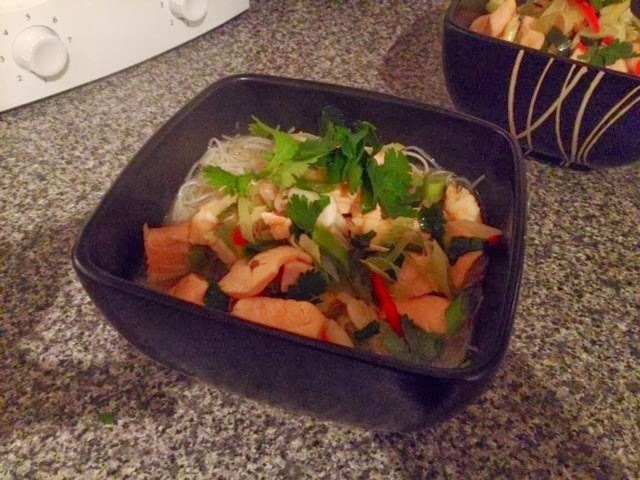 The rice noodles are really light so don’t worry about it being a heavy noodle based dish, they just add a bit of texture really. If you’ve not had them before they’re usually pretty easy to find with the stir fry stuff in the fruit & veg section of your supermarket. I think beansprouts would go well in this dish if you want to add an extra crunchy element. You could also adapt this by playing around with your different types of fish or adding Chinese mushrooms if you can find them. 1. Cook the rice noodles according to packet instructions. Set aside. Most will just take a few minutes frying. 2. 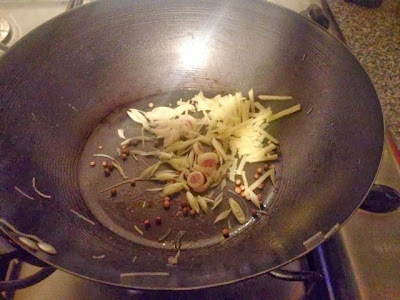 In a wok gently fry the ginger, lemongrass and coriander seeds for a couple of minutes. 3. Pour in the chicken stock and bring to the boil. Simmer gently for 5 minutes, then turn of the heat and leave to stand for 10 minutes. 4. 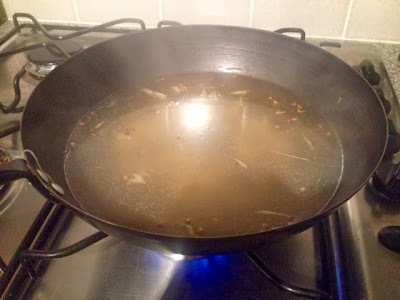 Return to the boil and add the chillies and garlic along with the fish sauce. 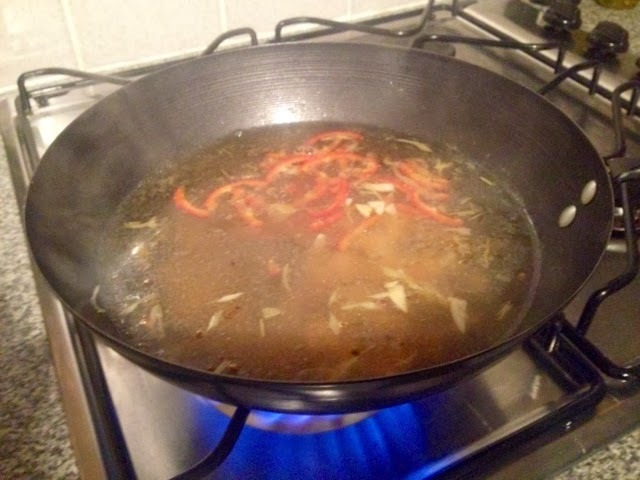 Reduce the heat and simmer for 2 minutes. 5. Add the prawns and the salmon and continue simmering until both are cooked through. 6. 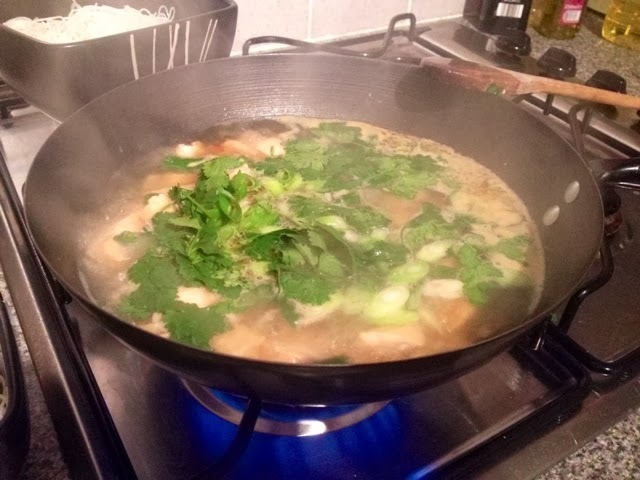 Add the spring onions, coriander and lime juice. 7. 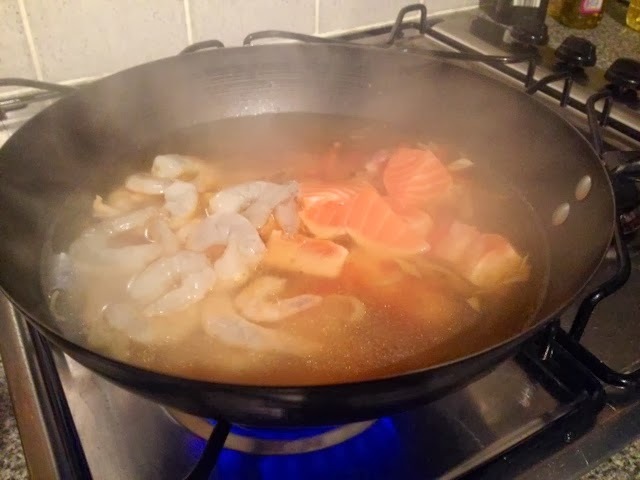 Halve the noodles between two warmed bowls and with a slotted spoon evenly distribute the fish between the two on top of the noodles. Pour the remaining broth over the top. Garnish with a few more fresh coriander leaves.